I wore this visor to death in Italy! From Rome to wine country, this visor went with me everywhere! I am loving that visors are a trend right now because you guys know how much I care about sun protection and healthy skin. I am always looking for a hat when I leave the house to walk the dogs, go to the bank, or even just take a drive. I gotta keep the sun off my face! The harmful rays of the sun darken scars, cause wrinkles and sunspots! No thank you! When I was in Italy last week, I purchased this leather visor (above) that saved me at the pool and while walking around sightseeing. It's so hard to pack hats when traveling because they always get smashed, so I was banking on finding a cute and stylish hat when I got to Italy. 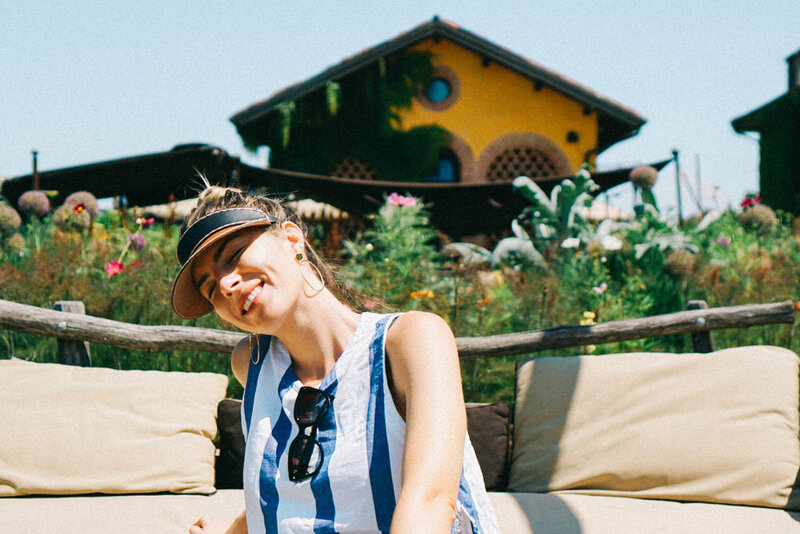 This one is no longer available online (I got it from "And other stories" in Italy but it's not showing up) but have no fear, I rounded up 12 options that are super fun and stylish that also have great sun protection. Check out my faves below. (All images are shoppable!) Have a great Friday guys!! See you in a couple days! xoxo! Have a great Friday guys!! See you in a couple days! xoxo!